India’s real estate market seemed to be on the path to recovery in 2018 as the impact of Real Estate (Regulation and Development) Act, 2016, (RERA Act)and Goods and Services Tax (GST) tapered down and home sales and new launches picked up. But the liquidity crisis at non-banking financial companies (NBFCs) has hit growth prospects of the real estate sector. Mint takes a look. How did home sales, project launches fare? The year began on a good note for the residential market, both on the demand and supply sides. After the slump of 2017, when the impacts of demonetisation and implementation of the RERA Act were lingering, home sales saw a steady rise, on the back of strong growth in mid-income and affordable housing. Real estate consultant Anarock Property Consultants Ltd estimates home sales will increase 16% this year to 245,500 units. New housing supply is likely to jump 32% to 193,600 units by the year-end. Unsold housing stock fell 8% to 687,000 units in the third quarter. How did home prices move in the top cities? Unsold inventory put prices under pressure. Home prices were either stagnant or saw a marginal rise. In Delhi NCR, prices declined 2%, real estate consultancy Liases Foras said in its third quarter report. In the resale market, NCR was the worst-hit, with prices falling as much as 15-20%, far behind those in Mumbai and Bengaluru, mainly due to weak demand from homebuyers and investors. Liases Foras data says the Mumbai Metropolitan Region was the only market to show an average increase of 1%; in other cities, including Bengaluru, Chennai and Pune, prices either remained muted or declined. Is demand for commercial office space rising? Led by tech firms and co-working spaces, office space leasing may grow 19% to 39 million sq. ft in the top 7 cities, says Anarock. But fresh supply may touch just about 32 million sq. ft.
Have private equity investments picked up in the commercial real estate space? Interest from large private equity firms, such as Blackstone Group LLCand Brookfield Asset Management Co. Ltd continued to grow. Apart from the growing demand for office spaces, the possibility of real estate investment trusts (REITs) listing has made commercial real estate, particularly rent-yielding office spaces, an attractive proposition. 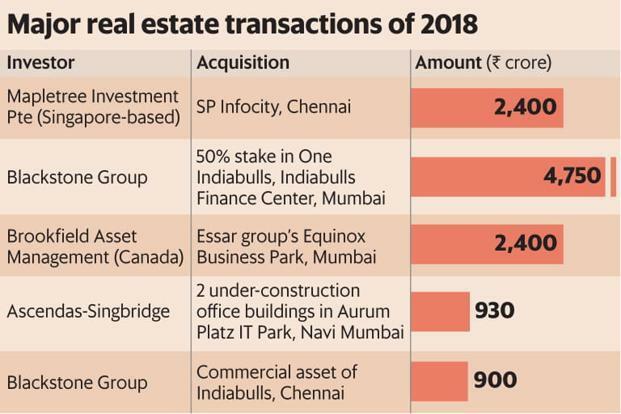 Property consultant JLL India estimates institutional investments in the real estate sector will touch $5.5 billion in 2018, the highest ever since 2009. How has the liquidity crisis at NBFCs affected real estate firms? Given that banks were wary of lending to builders, realty firms were dependent on NBFCs in the past four-five years to fund their growth plans or refinance existing debts. JLL says financing by NBFCs and housing firms rose to 58% of the total loans to real estate companies in 2017-18 from 36% in FY12. The liquidity crisis has, thus, put a question mark on the growth plans of many developers. Many believe real estate firms are likely to face short-term funding issues going into 2019.